The swoosh was originally red, but now loads of colours are available. 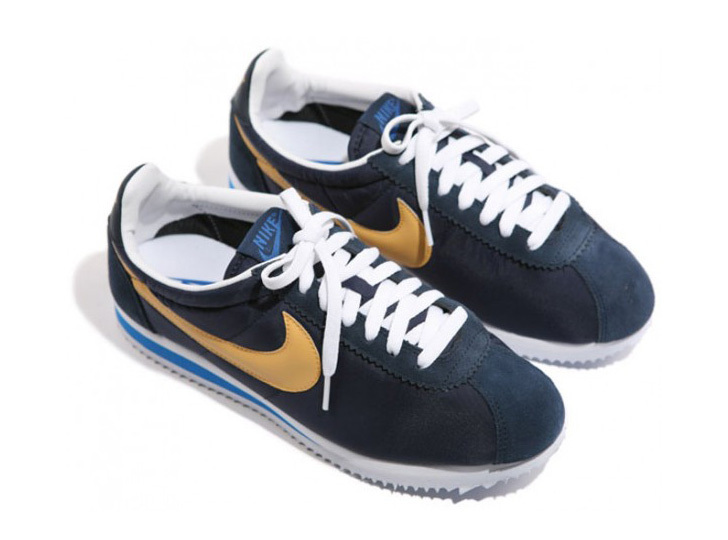 The blue-swoosh Cortez was so closely affiliated with gang culture in LA that during the 80s police outlawed the trainers to try and curb violence. 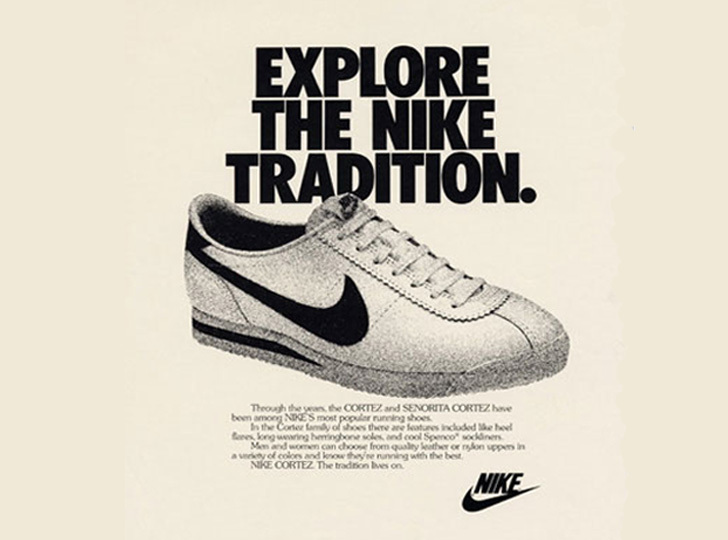 In 2009, the Nike Cortez Fly Motion was introduced, which features thinner, finer fibers bound together in the mid-sole to help absorb impact, providing a lighter but more cushioned trainer. One person likened it to 'running on the moon'. 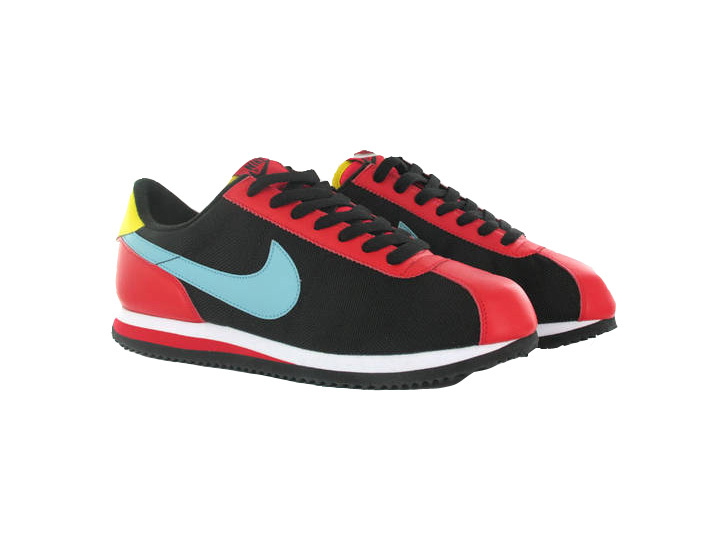 While normally keeping to simple colours, in 2007 the Cortez went all out - these red and black trainers are adorned with a sky blue swoosh, a yellow heel and a white mid-sole. Proof that a massive dollop of colour can actually look pretty stylish. 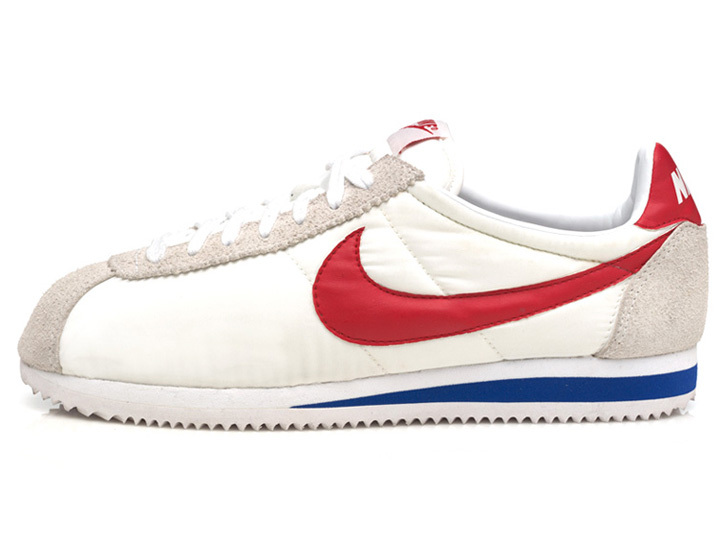 Started by Bill Bowerman in 1972, the Cortez was designed to take the strain of repetitive running by athletes; it had to hold up to 100 miles of training a week. Modeled on the cushioned comfort of a flip flop, a foam mid-sole provided comfort along the natural shape of the foot. 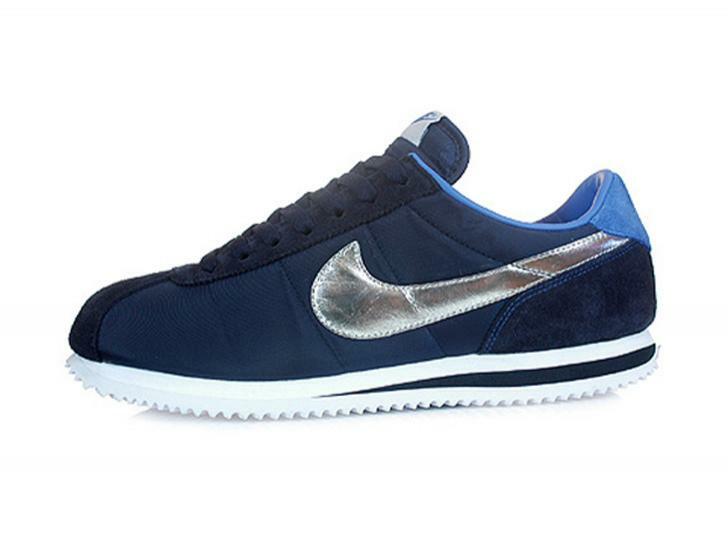 Nike may have kept things classic on 2008's Running Man Cortez collection (which also featured an updated Air Max) but the inky blue and silver swoosh gave it a futuristic look. 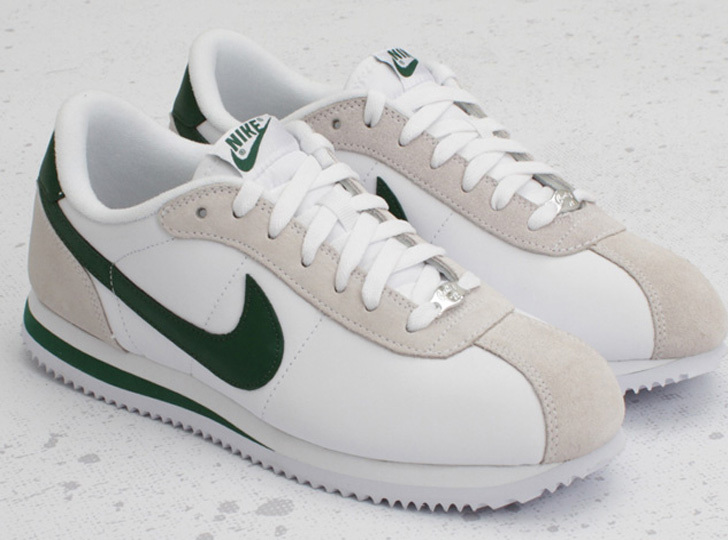 The Cortez gained the nickname "Forest Gumps' after the character of the same name ran across America in, er, the film of the same name. In 2002, Nike launched the Nike Chinese New Year series, transforming their classic trainers into designs inspired by the signs of the Zodiac. 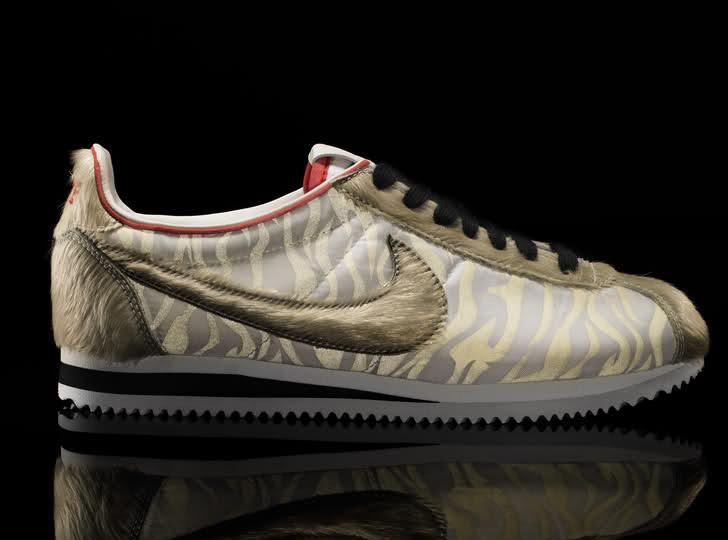 The Tiger Cortez Classic, released in 2010, was the first time a Cortez was used in the series, and featured a silk tiger-stripe print, with the classic swoosh made from horsehair. Quite a leap from the brand's athletic roots. 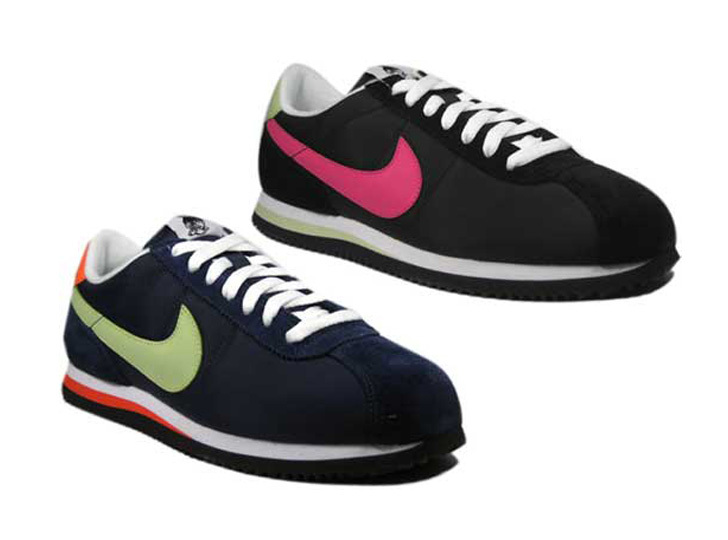 Part of Nike's Athletic Department series, which focused on sports and training apparel, these Cortez were made in black suede, with coloured accents along the Swoosh, mid-sole and heel. Sneaker-freaks will tell you the time to replace your Cortez' is when the teeth (the grip on the sole) have worn down. 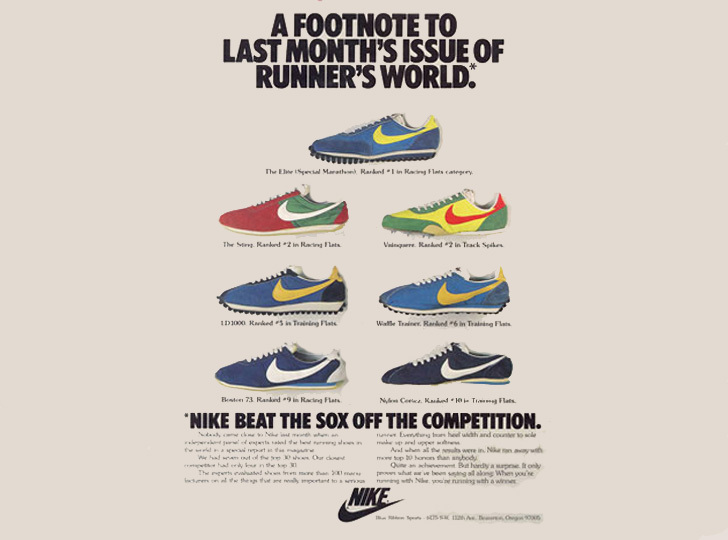 Another vintage Nike poster, showing the brand had no qualms with being a bit braggy. They were made of suede because this helped keep the shape and structure of the toe without being uncomfortable. 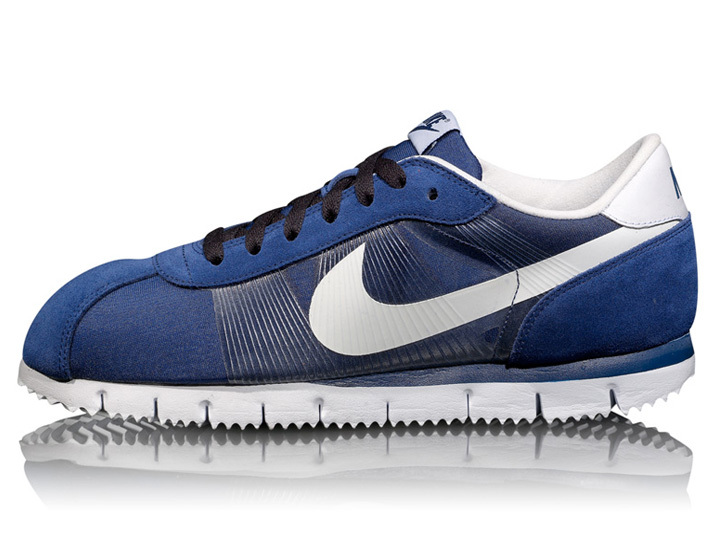 Reinvented and released this year, the modern-day Cortez shares a lot of the traits that made the original so popular. A fondness for low-key, muted colours mixed with a dash of colour (in this case, racing green) keep the shoes subtle while retaining their style. Although these may look a bit too stylish for the simple Cortez, they were designed this year as a fusion of new-meets-old-school trainers. A women's version was available in brown and pink which, to be honest, looked a bit mental. We like these ones - they're a little more grown up.